Impressionist Does Uncanny Kathy Griffin, Christina Aguilera, Natalie Portman and More! 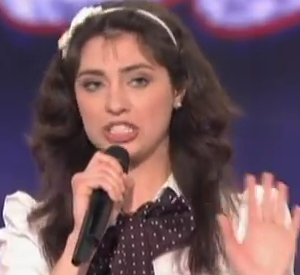 Comedienne Melissa Villasenor absolutely slayed on America’s Got Talent with her dead-on impressions of Natalie Portman, Kathy Griffin and Miley Cyrus. Her Barbara Walters and Christina Aguilera ain’t half bad either! We love how the headband goes up when she turns business on. So talented!